Published on March 26, 2010 in misc and Seattle. 19 Comments Tags: Seattle. On Monday morning I’ll be down in Burbank, CA at the Walt Disney Studios getting ears fitted for my new job. I’ll be working in the Disney Interactive Media Group as Director of Advanced Technology. The advanced technology group has a fairly broad scope, and a few of the things that we’ll be looking at include devices such as tablet computers / e-book readers, HTML5, and cloud computing fabrics. The world of media is being reshaped by technology, and I am excited to have the chance to help Disney navigate those changes. The Disney Interactive Media Group is located in downtown Seattle, a few blocks from the ferry terminal. So after nine years of working at home, I’ll be going to work in a “normal” office setting. I had several work at home offers, but I have been feeling restless about working at home, so I’ve decided to shake things up a bit on that front. Seattle locals, I’d love to catch lunch or coffee with you. Published on June 17, 2009 in Seattle. 1 Comment Tags: barcamp, bcs09, Seattle. This past Saturday I hopped over to Seattle for Bar Camp Seattle 2009. I wasn’t able to make it to last year’s event, and since we haven’t had many Bar Camp’s in Seattle, I wanted to see what was happening. 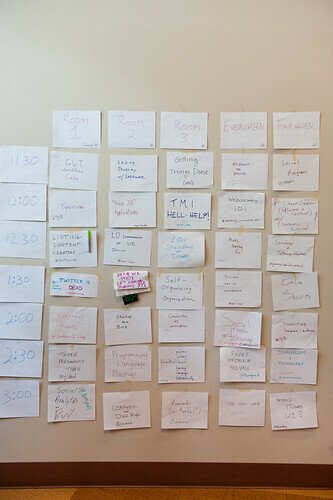 As usual, there was a wall where the schedule was developed as the day went on. I was happy to see that there were a number of people involved in organizing the event. Those folks were easily distinguishable by their red and yellow propellor beanies. The Bar Camp / Foo Camp structure for a conference is pretty liberating when compared to the usual pre-planned, eyes forward conference. However, it’s not enough to guarantee a good event. I’ve attended a number of these kinds of events, and in my view, who actually turns up is just as important as how the event is structured. Bar Camp Seattle had a lot of people who were interested in talking about various social media related topics. I have no idea if any of those sessions were any good, because I didn’t end up going to any of them. I ran into and met some developer type people, but not as many as I hoped to. Despite the use of Pathable’s cool registration / attendee matchmaking system, I didn’t find it that easy to make use of the information printed on my badge. I would have loved some clever mixer based on the badge labels or something along those lines. Brian Rice and I (but really mostly Brian) ran a session a session for people interested in programming languages. I was pretty happy because the session was very interactive, but the session length of 30 minutes made it hard to get very far during the allotted time. The best session that I attended was a session that was literally and figuratively off the grid. Brian Dorsey put up a session for sitting outside under the nearby bridge. The weather in Seattle was really beautiful last Saturday, so it really begged for being outside. There were about 9 or 10 of us who wandered out and sat talking about a wide range of topics. I enjoyed the sense of flowing from topic to topic, shifting naturally with the flow of conversation, the changing of roles of various participants as the topics changed, and so forth. I think that I am at a crossroads as to the value of these generic, unstructured events. I helped organize the first Seattle Mind Camp, and I am glad to see that there is now a Bar Camp in Seattle as well. At the same time, I’ve frequently left these events feeling unsatisfied. Beforehand I am filled with excitement at the possibility of meeting new people from other tribes / fields and somehow stirring the pot of creative juices. Most of the time, I end up leaving without that stirring having occurred. If I look back over the last four or five years worth of conferences that I’ve attended, only a handful of “unstructured” events really stand out. Those events were Foo Camp and the Scala Liftoff, and in both cases, I would say that the particular sets of people involved made a huge difference. Published on January 12, 2009 in python and Seattle. 0 Comments Tags: python, Seattle. The organizers are looking for talk proposals. Published on December 13, 2007 in photography and Seattle. 4 Comments Tags: photography, Seattle, strobist. The Seattle amateur photography scene is exploding. Here’s some video that shows what we’ve been up to recently. Published on July 9, 2007 in internet and Seattle. 2 Comments Tags: adobe, AIR, ria, Seattle. Published on April 6, 2007 in internet and Seattle. 2 Comments Tags: ignite, Seattle. Last night I finally made it over to one of the Ignite Seattle events. I’d been wanting to get over for one of them, but part of the rub is getting a ride from the ferry to the actual location. Fortunately, Ryan Stewart was kind enough to give me a lift to and fro. Ignite has a very interesting format. There’s a MAKE event before the talks get underway. The talk section is grouped into 30 minutes of talks and 30 minutes of mixing, which is repeated for either 2 or 3 talk blocks total. The talks themselves are 5 minutes long and you get 20 slides and 15 seconds per slide — the slides advance automatically, so it really is 15 seconds. If you’re a listener, it means you get a bunch of talks in a short time, and you are guaranteed that you only have to endure a bad or uninteresting talk for 5 minutes. If you are a speaker, it means that you really need to have your act together. It’s a challenging format, and even some experience speakers have trouble making it work for them. Karen Anderson‘s Work Place Survival Tips – there was one really good one — I hope she blogs it. I had a camera in my hand, so my attention was divided. Scott Berkun did what might best be described as a brief history of the decline of Attention. Shelly Farnham of Waggle Labs talked about social tagging, which is the idea of tagging people with semantics which might be useful. She used the example of tagging people at conferences with tags that would help them connect with each other. That’s a problem that resonates with me, but you can easily imagine other domains where this idea would be helpful. Best of show. I’m looking forward to seeing what Pathable.com turns out to be. Christopher Johnson‘s talk on names was particular interesting, because we’ve been doing some branding stuff at OSAF, and I found his approach based on sounds interesting. Even more interesting was his analysis of how Apple’s name related to the attriubutes of the Apple brand. Mark Novak from Microsoft crammed a security analysis of OpenID into 5 minutes by talking really fast. The 5 minute format means that the talks are also a kind of performance art. If you were an expert and familiar with his notation it was possible to follow the talk. If not, the performance was really good. Eric Nevala of the US Marine Corp talked about his experiences running IT for the Marines in Iraq. Eric received sustained applause and support from the audience. The Twitter backchannel for Ignite was projected on a wall. It was fun to watch some of that chatter go by, and you can use it to get a feel for what happened. After the whole thing was over, Ryan and I spent some time talking to Monica Guzman of the Seattle PI about the merits (or not) of Twitter. On the whole I had a great time. I got to see some friends I hadn’t seen in a while, and the talks and format were good. I like seeing folks tinkering with meeting formats — I hope that there’ll be more of that in general. 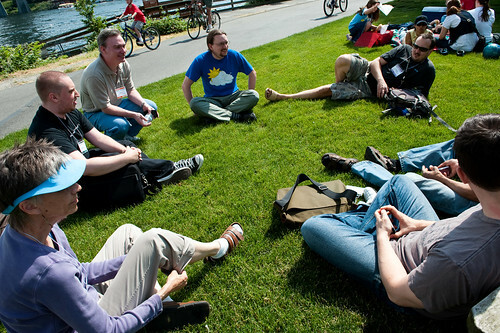 Between Mind Camp and Ignite, the technology community in Seattle might be bumping it up a notch. Kudos to Brady and Bre! I did have a camera with me, and the pictures are up on this Flickr set. 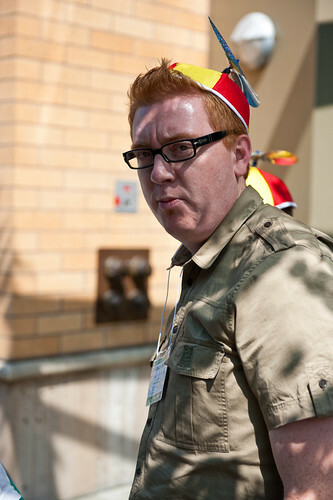 Published on February 9, 2007 in blogging, photography and Seattle. 0 Comments Tags: photography, Seattle, strobist. Congratulations to Eric and Rose Soroos on the birth of their new baby boy. Eric has been doing a wonderful series of Strobist inspired pregnancy photos (not safe for work). 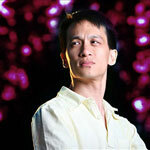 So if you are into Strobist stuff, you’ll probably want to check them out. I’m sad that the series has come to an end, but I am sure we’ll be seeing a new series soon.